This luxurious 5,000 sq ft condo situated in Baltimore, Maryland, was designed by Turner Development Group. Silo Point is the only successful luxury condominium grain elevator conversion in the world. When originally constructed in 1923, the grain elevator owned by the Baltimore & Ohio Railroad was the world?s largest and fastest. Turner Development transformed the towering landmark, incorporating the original grain tower and thirteen silos into the final design of the project. 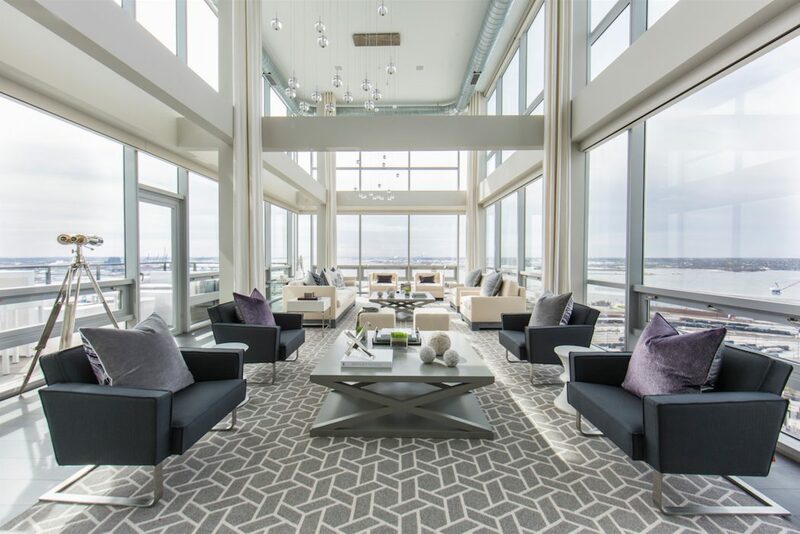 The penthouse is a three bedroom, three and a half bath unit with floor to ceiling windows on both floors and 360-degree views of Baltimore?s waterfront and urban expanse. The sophisticated industrial modern design of the penthouse is punctuated by premier finishes including eco-timber grey weathered flooring, polished marble waterfall island and herringbone marble backsplashes in the kitchen; stainless steel rainfall shower, stacked stone wall and floating vanity in the master bathroom. This 5,000 square foot, fully integrated smart home features iPad-controlled lighting, window shades, heating & air conditioning, and full-home music system. Nest thermostats, LED lighting and Lutron light control and dimmers add to the technology savvy home, as do the Sub-Zero, Wolf and Thermador appliances that allow for a premium cooking environment.